Alts | Nuts and bolts. Mostly nuts. I apologize for the long break in my posts – not that I post regularly enough that anyone might have noticed. To keep the story as straightforward as possible, I am being shuffled between offices and positions, and I took a vacation, since I wasn’t going to be doing anything productive anyway. I regret to inform anyone who hoped otherwise that the Rodent Lord still rules the Orlando area. Anyway… enough talk about the physical, on to the virtual. Even before my trip to Florida, I was testing the waters with a Warden alt. I like the class, but I have noticed that they build up threat over time, not using some one-button taunt power like the guardian. This is of note simply because other people I group with seem to miss that point, and they fly straight into a DPS frenzy the moment that the group pulls a mob. Maybe it’s just my experiences as a glass-cannon mage in WoW, but I always let the tank gain a nice agro lead before joining in – except against swarms of normal mobs, which a Champion can cut to ribbons. I have to admit that the Warden solos nicely, is a wonderfully flexible class, and is fun to play. This beat my experiences with my Guardian, who I just can’t play for more than a single skirmish at a time because I find the class so dull. It’s a bit sad, because I put so much effort in just getting my Guardian to level 40. The Warden (named Galmann, which loosely translates to “madman”) is almost ready to enter Moria – I think it might be time to pause and clean up any loose ends in the Volume I epic. I’m not in a rush to hit the endgame, I’m enjoying the journey too much right now. 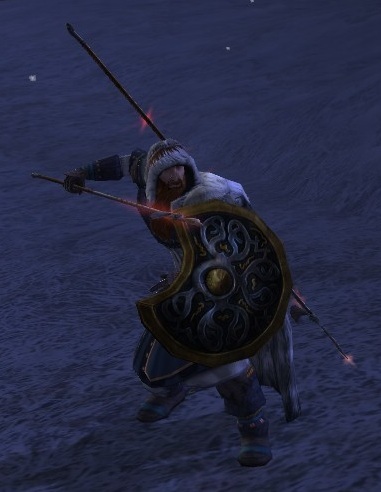 There are two ways to force me to keep a LotRO alt. The first way is to let my trade skills get so high that the character is indispensable. The other way is to pile on the badges, titles, or Deeds. Thus, I am doomed to keep the Warden that I’ve been playing, as he has cleared the Deeds in all three starting areas and is just about done with the Lone Lands. You say that it sounds silly? Consider that Deeds grant a significant stat bonus for characters before you take that stance. They are also far from a trivial investment, time-wise. Sometimes there is a different scenario: you really enjoy a character and you want to keep it. In such a case, I suggest that you complete the Deeds in all three starting zones, plus the Lone Lands and the North Downs. After that, you can pick and choose which Deeds to complete (I still suggest that you finish all of them, as they now grant Turbine Points). That way, you have a good foundation to draw upon. You can play the game without completing any Deeds, but why turn your nose up at significant stat bonuses which cost you nothing but a little extra time? On the Champion front, I have signed Burhhelm up for two raids this weekend as a standby attendee. Although I enjoy playing the Warden, I still enjoy playing the Champion far too much to ever set him aside for long. Here’s to hoping that they need a little AoE. So, only a few days after Burhhelm has gotten the gear for which I was working, and my circle of friends is trying to get me to drop playing him in favor of a low-level Warden. This is mainly due to the fact that one of our group refuses to level any of his characters beyond 55 before each and every one of his alts has caught up to the same level. Personally, I find the whole thing slightly irritating, but they are my friends and the game is about their enjoyment as much as mine. The alternative to playing my Warden is to play my Loremaster, but the Loremaster is too high a level to be hanging out with the other characters in our lowbie group. Thus, I have begun doing some work on Galmann, my Warden from Dale. If I really am going to play this Warden all the way to level 65, though, it will require completing various Deeds. That includes Shire Deeds. Such as delivering mail and running pies around. I can foresee that this will only nurture my pathological hatred of Hobbits. You just know that when the Warden hits level 65, he will sit in Enedwaith killing bugan while laughing maniacally. It seems like very little is going on in-game for people level 60+ right now. I think that most people are waiting for Volume 3 to be released before they dedicate any real play time to the game right now. Be that as it may, Burhhelm has been skirmishing quite a bit, lately. If he ever does come into possession of a decent 2nd age item, he will have all of the scrolls needed to boost the tier of the legacies. Other than that, there are very few activities going on right now for him. On the alt front, my Loremaster is up to level 22, and I even tried playing around with my Guardian a little bit. I want to get the Guardian into skirmishes, just to see how the class handles. The Loremaster, on the other hand, is being groomed to visit instances. I’m looking forward to visiting the Great Barrow once again. Let’s see how many hits that gets. 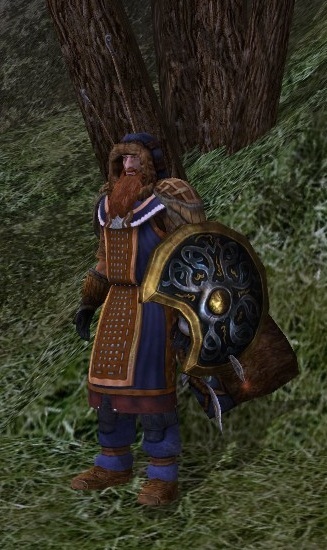 I have to confess that LotRO is getting a little repetitive, when playing Burhhelm. On my average weeknight, I log in, go one three or four skirmishes, then log out. Everyone that I know seems to be working on alts right now. Speaking of alts, my Loremaster seems to be coming along nicely. I only play the character for one or two days each week, but he makes progress. I have one final character slot open amid the sub-level 10 collection of characters that I have tinkered with, and I am considering the creation of… another Champion. Call me crazy, but I play my Champion beause I genuinely like the class. I play alts of other classes because I have to, in order to fill some role or another. I play my Champion because I want to. If I put myself on this course of action, then I’ll need to decide what race to play. I have much to ponder. Last night, I finally found myself with enough spare time to log in to Vortex for a little while. Keene, my Archmage, is now rank 21, and is the proud owner of a single target DOT/heal debuff. The only problem is, of course, that he’s expected to be a healbot. As stated previously, sitting around and waiting to heal is not exactly what I’d call exciting. Some people love it – I’m not one of those people. So, I woke Belus from tier 1 torpor, and ranked him up to 13 through RvR alone. Belus is my White Lion, and the difference is significant. Want to play a finesse class? Play an Archmage. Want to play a wrecking ball? Play a White Lion. The fact that White Lions get some limited group-buffing attacks and crowd control later in their careers is what seals it for me. I really prefer the White Lion over the Archmage. Beside, after a day of dealing with people at the office, I really feel the need to go beat on something when I get home. The White Lion fits that need quite well. Telling your lion to go chew on a goblin shaman is cathartic. Tiers 1 and 2 on Vortex were less crowded than I had hoped, though – I only saw five slayers the whole night. While this may be good for realm balance, it isn’t the surge of lower-ranked characters that I was hoping for. Speaking of surges, Mythic has decided to fold several nigh-empty servers into other lower-populated ones. Ostermark is one of the servers which is going to be receiving people from the nearly empty source servers. It’s a good idea, but I don’t think that it’s going to bring enough people to Ostermark to inject life once again. I wish they’d just let me transfer Koljarn out of there. I got about an hour of RvR in last night after I got home from the office. It was productive enough – my Archmage is close to R21, and he just hit RR18. However, I do find that playing a healer – even a hybrid – is much more of a waiting game than playing a DPS class. When I play Koljarn, one of my White Lions, or even a Ironbreaker, I feel like I can roll out on my own and do whatever I please. There are few, if any, limits on what I can attempt. PvE, RvR, I can switch back and forth and be very productive at whatever opportunity presents itself. When I play Keene, my Archmage, I feel boxed in. My solo effectiveness is much more limited, whether it is RvR or PvE. I have to wait for other people to show up in order to be really effective. That galls me. Self reliance is vital to MMOs. Yes, they are social games, and you should play them with other people. However, it is not their job to be there in order for you to enjoy your experience. That’s up to you. If a class forces you into relying on others to provide basic capabilities (such as damage output), then you’re going to end up frustrated. That’s how I feel when playing Keene, some times. Dang Orcs! Get off of the Lawn!